Tykes Oli McBurnie watchs his header cleared off the line. Picture Tony Johnson. 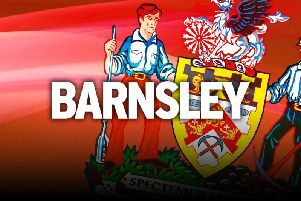 Barnsley’s stuttering home form continued as in-form Millwall left Oakwell with maximum points. The relegation fears continue for the Reds, who were punished by a Millwall side who bagged their sixth consecutive Championship away win and appear to be homing in on the play-offs. Barnsley, meanwhile, lost their ninth home game of the season and are now only outside the second tier drop zone on goal difference. Recently-appointed boss Jose Morais continues to struggle as he has now only taken five points from the seven games since he took over from Paul Heckingbottom as head coach. Morais said: “We conceded the first goal in a very childish way. “We tried everything to score the goal we needed before they scored a second, buy they had a good strike with the in their favour. “When something like this happens, you just feel sorry for your team that it wasn’t a goal for your team. The Reds had already gone mighty close through Kieffer Moore and Oli McBurnie by the time the Lions roared into the lead after 24 minutes. The hosts were clumsy in losing possession, and Jed Wallace was able to nip in, cross the ball for Lee Gregory, and he made no mistake from close range. Liam Lindsay headed inches over the top as Morais’s men sought a swift response, then just after the interval the Reds centre-back was denied by a super close-range stop from Jordan Archer. Millwall punished the Reds by grabbing a neat second goal after 63 minutes. This time Ben Marshall cracked home a world-class strike from 25 yards. After that the Reds went close as McBurnie saw an effort hooked off the line, while at the other end Millwall fluffed a chance to go three clear when Fred Onyedinma should have done better. Morais’s opposite number Neil Harris felt a certain degree of sympathy for the Reds on Saturday. The Lions are in terrific form at present and a sixth win in seven games lifted them closer to the play-off places. However, Harris was impressed with the Reds’ performance as they continue their survival fight. Harris said: “If you look at Barnsley, they’ve got a definitive style of play and they have improved. “We had to find another way to win the game. “I thought Barnsley threw a bit of caution to the wind n the final half-an-hour and were unlucky not to score. It seems that the phrase ‘fortress Oakwell’ is increasingly becoming a thing of the past, and that must be a worry for recently-appointed boss Jose Morais. At this stage of the campaign, and with the Reds now only outside the Championship drop zone on goal difference, it’s imperative they grab a much-needed home victory soon. No home win since early November is quite an alarming statistic, and it needs arresting quickly. It’s difficult to pinpoint exactly why the players just can’t seem to turn it on at home at present, though they did give it their best shot against in-form Millwall at the weekend. There are only four more home games remaining this term, though, and the next one? Lee Johnson’s promotion-chasing Bristol City arrive in town on Good Friday.